June 24, 2011- The Mt. Washington Hillclimb, known affectionately as the "Climb to the Clouds" is making a comeback this weekend after a nearly ten-year hiatus. The event, one of Americas' oldest auto races, features a strong 70-car competition field with some of the best drivers and cars from around the world competing for "King of the Hill" honors. The first day of practice, on the lower half of the 7.6 mile Mt. 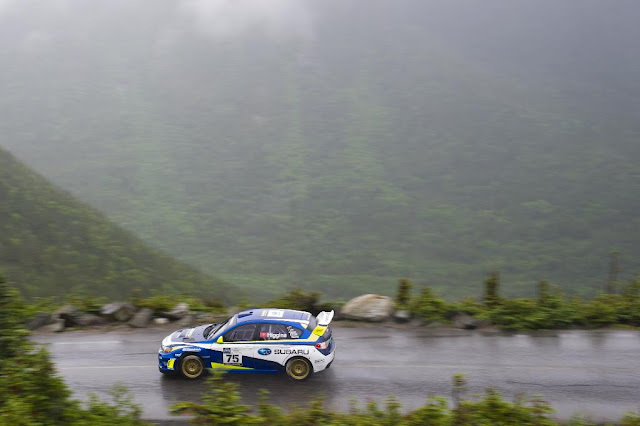 Washington Auto Road, was conducted this morning with Subaru driver David Higgins, from the Isle of Man, toping the time sheets nearly twenty seconds faster than his closest challenger in rainy and challenging conditions. The entry list includes two of the past course record holders, former and current rally champions, high-powered open-wheel cars, a vintage class filled with cars steeped in motorsports history and a first for the event; a purpose-built race-truck. "What a road! 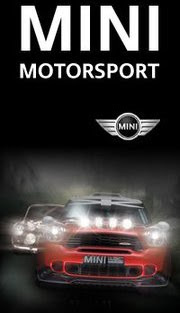 Really good fun," said Higgins, who has never competed on the auto road before. "The conditions were really slick and challenging plus I'm still trying to learn the road." Higgins is driving a Vermont SportsCar prepared Subaru Impreza WRX STI rally car. Former Climb to the Clouds record holder Tim O'Neil of Whitefield, New Hampshire, who last competed here nearly twenty years ago, was sixth fastest on the morning practice session. "I don't think the auto road has changed much in twenty years but my memory has gotten worse!" The Mt. Washington Auto Road will see a truck race up its narrow serpentine course for the first time in its history as daredevil Mike Ryan of Santa Clarita, California takes his purpose-built Freightliner 14.7 liter, 1,950HP turbo-diesel-powered race-truck up Mt. Washington in the Hillclimb Special Class. Ryan was an impressive 31st fastest on the morning practice session. Evening entertainment kicks off tonight with the Jim Devlin Band performing at 8pm on the Climb to the Clouds stage at the base of the Mt. Washington Auto Road followed by a Fireworks show. A second practice is scheduled for tomorrow and at 8pm Boston-based TAB The Band, who recently toured the US and UK with the Stone Temple Pilots, will perform on stage. Race day is Sunday where all teams will have two full course attempts to the summit. Grandstand seating will be available for spectators at the start area while several on-course spectating areas will be available. Tickets and schedule information are available at http://www.climbtotheclouds.com/. Fans will also enjoy car displays, vendors, food and a beer garden. All festivities are located at the base of the Mt. Washington Auto Road in Pinkham Notch, New Hampshire.